The electric guitar was invented in 1931 by George Beauchamp. Since then, thousands of iterations have appeared, with my favorite being the rocket-shaped Stratocaster. Produced by Fender since 1954, the Stratocaster has an illustrious history: Listen to guitar nerds talk about them long enough, and they’ll start to sound like they’re discussing wine – Stratocasters produced in 1957 and 1962, for example, are believed to be of an especially good vintage, and in 2018, can fetch anywhere between $20,000 to $30,000. This particular example… is not one of those. In the late 70’s and into the 80’s, many Japanese guitar makers made knock-offs of popular guitar shapes, including the Stratocaster. These were infamously known as “lawsuit guitars”, because of the resulting lawsuits from manufactures like Fender. Ironically, these Japanese counterfeits were often as well made as their U.S. counterparts, partly because Fender was struggling financially at the time and were doing weird things like removing the Stratocaster’s iconic jack plate. 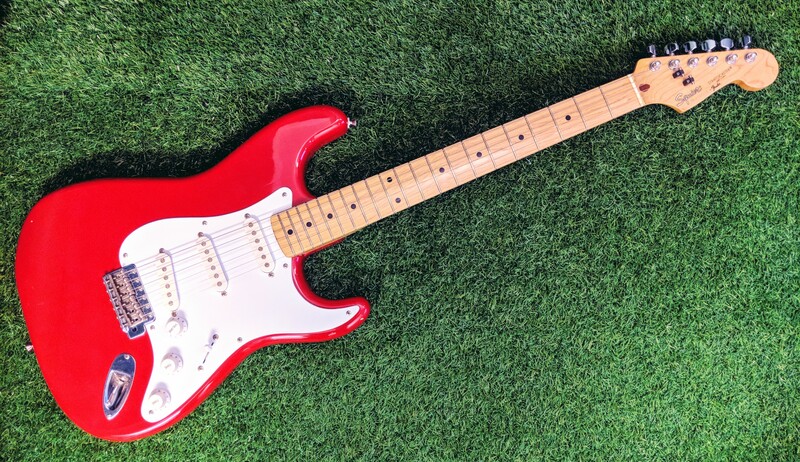 To fend off these copycats, Fender revived the Squier brand (originally a maker of guitar strings), and started producing their own guitars in Japan. In the first few years of production, the guitars were essentially clones of American Stratocasters – to the point where it was rumored that the factories actually shared a common inventory of parts. Although these guitars were originally sold at a lower price point than their Fender counterparts, a Japanese Squier with a “JV” or “SQ” serial number (from the first few years of of production, up to 1984), can sell for about $1,000 to $1,500 today; about the same price as a new American model in 2018. Subsequent generations of Japanese Squiers would start to sport cost cutting measures. The guitar pictured was manufactured in 1987 at the legendary FujiGen Gakki, and has an “E” serial number. It has ceramic magnet pickups, which are cheaper than using an AlNiCo (aluminum, nickel, cobalt) alloy. It uses lower quality electronics, such as a plastic printed circuit board switch rather than a metal mechanical one. It also features various anachronisms, like a single-ply 8-hole pickguard (which were used by vintage Stratocasters from the 50s and early 60s), yet modern-style tuners and string trees. Despite these oddities, I bought this guitar because it had soul. Let me explain: Since the advent of C&C technology, every large guitar maker has been able to churn out a consistent stream of guitars largely because of automation. A machine cuts out the shape of the body complete with all the correct routing, with no humans involved to mess things up. Where humans do mess things up is in the details – as the guitar is assembled, people are still needed to dress the metal frets, solder all the electronics, tidy up the wiring, assemble the guitar, and ensure that everything has been adjusted correctly so the guitar feels playable. It’s in these human components that this 30-year-old guitar feel alive. The parts of the guitar that someone had to work are impeccable: The fretwork is immaculate, the fingerboard has had its edges smoothed off by hand (something that’s advertised as a “feature” in expensive guitars today), and the wiring of these cheaper components is pristine. It’s clear that someone cared about their job, and didn’t feel like they were building an “inferior” guitar. Previous Post Previous post: Who’s on your committee?